/ Video Interview? Get Ready to Ace It! Video Interview? Get Ready to Ace It! With 6 out of 10 recruiters using video to interview job candidates, it is crucial to understand how to make a video interview work to your advantage. It’s hard enough to ace an interview, but the intervention of a video camera adds a new twist. Some good points have been raised by Paul J. Bailo, author of The Essential Digital Interview Handbook. (2) Embrace the technology as an way to communicate those messages. Make sure your lighting is clear and flattering. Two lights in front of you and one in back works well. Don’t get caught off guard: cover the camera lens and turn off the microphone until you’re ready to be seen and heard. On a more basic note, if you’re using a laptop, make sure the battery has enough charge! Some of the most crucial body language signals revolve around eye contact. In a previous post I passed along the trick of putting a photo of a friend, with a hole punched in it, over the camera hole on your computer. But don’t stare at it the whole time, which would be like maintaining 100% eye contact in a conversation. So I got to wondering, what is the right amount of time to maintain eye contact? According to noted social psychologist Michael Argyle. Where should you look when not “making eye contact” (looking at the camera)? You might put some key talking points (key words! not whole sentences or paragraphs!) right above or to the side of your computer; you will seem to be looking beyond the other person, as we sometimes do when thinking. And of course you should occasionally glance at the interviewer’s face on your screen, but too much focus there can look evasive or disinterested. Are we over-thinking all this? Possibly, but as the Toastmasters article points out, 55% of percentage of the communication in a video interview is via your face, and only 7% is the words you say. (The other 38% is tone of voice.) And even though interviewers may consciously make allowances for the unnatural circumstances, there will be an undeniable gut level reaction to these nonverbal cues. Concerned about ageism? Realize that positively making the most of the new and technological – instead of visibly struggling with it – will help counteract a key stereotype about older workers. Also, give special attention to lighting and makeup. Attention, guys: Even men get made up for photo shoots. Use a little face powder if you have very shiny skin, and you might try a tinted lip balm if you have very pale lips. 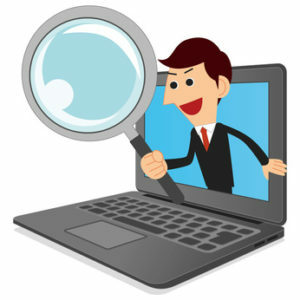 Don’t expect to be at ease with video interviewing all at once. Take it a little at a time, start well in advance, and prepare to stand out and get the job.